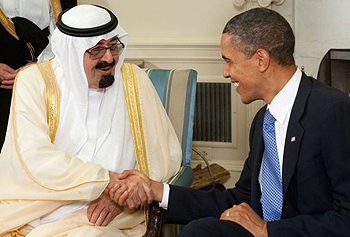 The Obama administration recently closed a $60 billion arms deal with Saudi Arabia. "Many in this hall count themselves as friends of the Palestinians. But these pledges must now be supported by deeds," President Obama said at the United Nations last week. Does that include addressing the trade in defense in the Middle East, especially by America? From the Pashtun highlands of Afghanistan to the corridors of corruption in Afghanistan's government; from the quagmire of the Israeli/Palestinian divide to the geostrategic question of a nuclear Iran; the presence of America's burgeoning defense industry is felt. 84 F-15 fighter jets, 70 F-15s, 70 Apaches, 72 Black Hawks and 36 "Little Birds" are the latest U.S. military apparel en route to the Middle East—this time, ostensibly to counteract the Iranian nuclear threat. It's the biggest arms deal in U.S. history. And its culmination could well substantiate the core of a Middle Eastern arms race that's been fuelling conflicts in the region for decades, if not an entire century. The composition of defense within the region, especially with advancing nuclear technology, is central to the rationale for both defense industry and military interventions. According to the U.S. Foreign Military Sales program, between 2005 and 2009 American defense sales increased from $9.8 billion to $31.6 billion, nearly all of which went to the Middle East. With every defense acquisition by states in the Middle East, however, threat levels of others are raised. Of geopolitical concern is the subsequent military assistance that progresses via strategic alliances for balancing power. As an established process, this defense trade in its current strategic form could be preventing open systemic accord from developing into regional security arrangements geared to all-inclusive global security. Israel, for example, doesn't reason security through the latest massive injection of U.S. defense to Saudi Arabia. As the Guardian noted recently, Saudi military superiority now factors as a strategic justification for greater Israeli defense. Will Washington comply? Since the U.S. economy has been in dire straits, America's defense industry has risen to one of the country's most lucrative export commodities, if not the most. According to the Defense Security Cooperation Agency, maintaining an industrial base is a necessary investment in U.S. security. Indeed, the U.S. government views arms transfers as a necessary instrument of U.S. foreign policy. "These sales also contribute to American prosperity by improving the U.S. balance of trade position," notes the government's Foreign Military Sales program. So the question is: does U.S. foreign policy mandate a certain amount of sales each year? If so, does the reasoning in the U.S. political/security realm converge with those of the trade/commerce one to the point where conflicts can justify arms sales, and vice versa? These questions cast a different light on Iranian nuclear technology, and by extension the current Israeli/Palestinian peace process, and indeed Afghanistan—basically, because they derive from the geopolitical context, which encompasses broader-ranging causes of Middle Eastern conflicts in respect of the regional methods of dealing with them. As such it addresses both military strategy and global economic forces. "Iran is the main reason an Israeli-Palestinian peace deal now has a chance," wrote John Lyons in the Week-End Australian last week, "to clear the desks for an Israeli strike on Iran." Has he taken into account all the relevant factors? Considering the Israeli Defense Force has striven to become an army requiring annual military sales, and the degree to which they sustain the Israeli economy, the rationale for deterring Iranian nuclear ambitions militarily via Israeli defense systems could have an economic imperative. And given the level of defense transfers between Israel and the United States, does that imperative include the United States? Only geopolitical mechanisms can clarify the rationale. Progressing state legislative infrastructure to the regional framework on all industrial practices, including defense industry, directs both border defense and energy needs towards broader-ranging objectives of security. Geopolitically the legislative process transcends the diffuse logic of military rationale. Israel, for example, persistently resistsIAEA nuclear inspections and the NPT, on the proviso of full Middle East peace. The United States backs the logic. "Zeroing in on Israel, widely believed to be the region's only nuclear power, could jeopardize an Egyptian-proposed conference in 2012 to discuss creating a Middle East free of weapons of mass destruction," noted analyst Antonia Dimou in August. Glyn Davies, the U.S. ambassador to the IAEA, agrees. The rationale is that it sends a negative signal to Middle East peace talks, even though systemic accord is finally forming amongst Arab states as well as Iran, for Israel to abide by the NPT. Again this is where geopolitical mechanisms would clarify strategic dissent. In essence, the process engenders stated prerequisites for Israeli statutory NPT compliance. Systemic legislation on defense and its industry codifies state recognition on the basis of general resource management and develops progressive accord on that basis rather than a ceasefire of transient "peace." It thereby transcends theocratic discord between Islamic Iran and Jewish Israel. General sustainability, after all, underpins the geo-regulation of all state industries as well as defense. And that comprises both Iranian and Israeli nuclear industrial practices. However, it also concerns recalibrating the U.S.-Israeli strategic defense alliance. Would Washington comply?